CoreCommerce is a US-based eCommerce software provider which has more than 13,000 customers throughout the world in more than 70 countries. The company has received a 93 percent customer satisfaction rating and releases updates to its services every month or two. Of all of the platforms we looked at, CoreCommerce provided one of the easiest to use, with great features for a low price. We were impressed with this product second only to Volusion. CoreCommerce offers excellent mobile and social media integration. With the included product feeds, it will help boost awareness of your products. CoreCommerce does not offer 24/7 customer support. 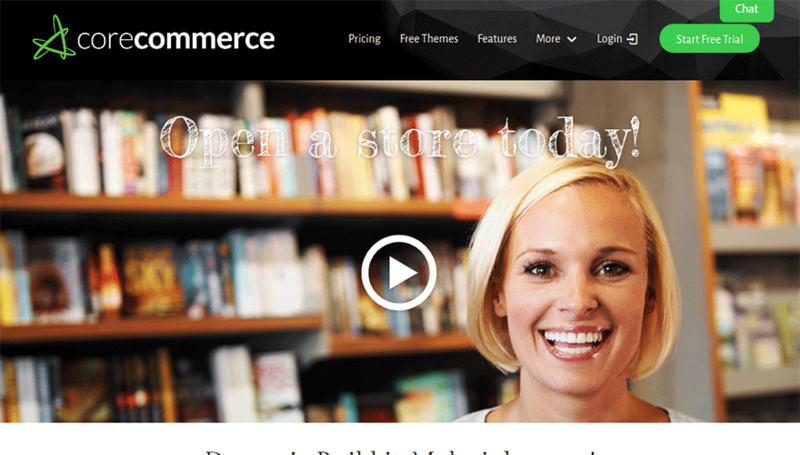 CoreCommerce provides you with more than 250 free themes to help you design the perfect store. You can customize the designs easily with the Easy Design Editor and choose from 6 different templates for each product page or build your own. You don’t need any knowledge of code to create a fully customized, beautiful storefront to impress your customers. The store features are SEO friendly and will help you to rank well by optimizing your product pages. For each product page, you can do advanced customization with color swatch support, multiple photos/views of each item, options for size, and image zoom. Cross-selling and up-selling features are available, as well as features to help you draw attention to new products and featured products. The administration part of the product is simple to use and provides you with in-line help for every feature so you don’t have to go looking for answers elsewhere. Using the management tools you can analyze return on investment (ROI) data, manage discounts and gift certificates, customize emails, view and process receipts and orders and much more. The secure checkout page has a 99.9 percent uptime guarantee and SSL security. Unfortunately there is no fraud prevention, staff access controls, or delivery network. Security was the area which took the biggest hit in our rating. Marketing features for CoreCommerce include a coupon system, gift certificate and registry system, refer-a-friend feature, and options to offer free shipping. A field during the order process allows customers to share how they discovered your site so that you can receive feedback on your advertising methods. A built-in email newsletter program helps you to send targeted emails which have high delivery and open rates. You may also manage affiliates to help spread the word. Social media marketing features enable you to sell directly via Facebook and to spread the words through share buttons. Customers can quickly and easily start an account on your site using their Facebook, Google, or Twitter login. There are five tiers of pricing for CoreCommerce. The first tier, Pioneer, is geared at owners of small shops and costs $19.99 per month with no startup fee. This is actually a slightly better deal than we’ve seen for most stores; instead of being able to sell up to 100 products, you may sell up to 150 products. You also get 5 email accounts and $50 in marketing credit for Google AdWords. The advertising credit is a bit less than we’ve seen at other venues, so whether you see this as a superior deal or not depends on your needs. The next package up, the Advanced account, costs $34.99 per month and allows you to sell up to 500 products. You get $50 in marketing credit, 10 email accounts, and there is no startup fee. The Professional plan costs $59.99 per month and lets you sell up to 1500 products. You get 15 email accounts and the same amount of marketing credit. The Expert level costs $99.99 per month, and you may sell up to 5,500 products. You receive 20 email accounts and $75.00 in AdWords credit. The Premier Plan is ideal for very large stores, since you may sell unlimited products for $149.99 per month. You are given 25 email accounts and $75.00 in advertising credit. A 15 day free trial is available if you want to check out the features first hand before you commit to a package. Customer service is lacking in several areas, but is still relatively comprehensive. You can reach an agent via phone, live chat or email, but help is not available 24/7/365. You can also turn to the knowledge base, video tutorials or forum for answers to your questions, but there is no user manual and no Frequently Asked Questions page. A company blog is available to tell you about updates to the service. Even though we docked a couple of points for security and customer service, overall we were very impressed with CoreCommerce, which has excellent options for marketing and product display. The store administration features are top of the line, and the program seems to be very user-friendly and accessible. Pricing is excellent, especially for owners of smaller stores who want to get more for their dollar. TopFiveAdvisor gives CoreCommerce a solid 9/10, and recommends this platform as one of the best eCommerce solutions out there.